Rabbits, squirrels and other resourceful critters will menace your garden relentlessly as they search for food. Many of these animals can take vegetables right out of your garden and damage plants and trees. Soil Services offers rodent deterrents that will help keep these critters away from your garden, lawn and home. Ask Soil Service for the Right Answers! How do I know what animal is invading my garden? Swing by or give us a call today! 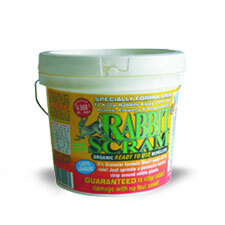 Rabbit Scram rabbit repellent is different because Rabbit Scram is more than just another offensive scent or unpleasant taste to foraging rabbits. Blended from selected organic and natural components, Rabbit Scram rabbit repellent is sniffed off the ground by foraging rabbits before they enter your gardens. Rabbit Scram is GUARANTEED to work.